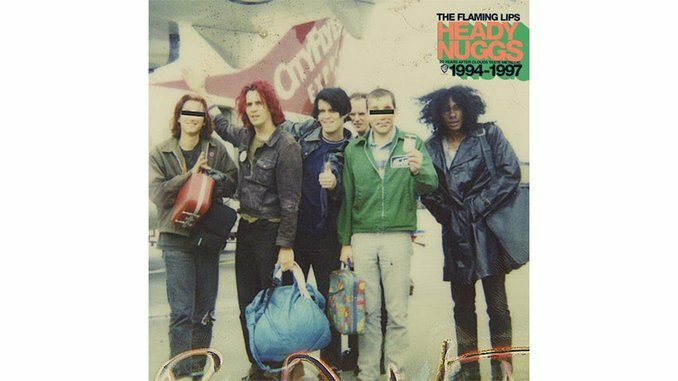 Heady Nuggs: 20 Years After Clouds Taste Metallic 1994-1997 is a three-CD celebration of the Flaming Lips’ ‘90s masterpiece that represents the genius of the band during a most crucial transitional period. In the mid-‘90s, the Oklahoma group was still in the throes of its alternative rock phase. And on Clouds Taste Metallic, frontman Wayne Coyne and co. were out to prove just how serious they were about making experimental and dangerous pop music. Twenty years after its release, Clouds Taste Metallic comes across as even more influential given the context of the Lips’ last decade and a half of music and activity. The departure of guitarist Ronald Jones marked a shift in the band’s sound and identity, but could in no way foreshadow the flamboyant experimentalism that would come—from Coyne performing in a giant bubble at massive concert festivals to collaborating with a pop hit parade including Justin Timberlake, Ke$ha, and Miley Cyrus. “Do You Realize? ?” even became the official state rock song of Oklahoma and the band adapted “Race For The Price” to be the fight song for the Oklahoma City Thunder during its 2012 NBA Finals run. The group has reached such a level of populism that hearing The Lips at this very elementary stage (on only their third LP on Warner Bros.) is actually quite refreshing. As the band moves further away from the gratuitous and bombastic animated nature of its mid-’00s with darker and weirder albums like the 2009’s Embryonic and 2013’s The Terror, hearing Clouds Taste Metallic in this context gives this period a renewed sense of importance. Heady Nuggs is a magnificent deluxe edition of Clouds that contains a windfall of rarities. While the first disc is just a straightforward reissue of the studio LP, the rarest gem is disc two of the set—a previously promo-only EP called Due To High Expectations The Flaming Lips Are Providing Needles For Your Balloons and a collection of demos and live cuts called The King Bug Laughs. Disc two includes wild covers of Alan Vega’s “Ice Drummer” and Smog’s “Chosen One,” as well as deconstructionist versions of David Bowie’s “Life On Mars?” and John Lennon’s “Nobody Told Me.” The Lips also offer a live version of “She Don’t Use Jelly” from a radio session at Oklahoma City’s hit music station KJ103. Finally, the last disc features the soundboard recording from a show at the Seattle club Moe’s from May 10, 1996. It’s a raw and uncompromising performance that is a far, far cry from the glitter and stuffed-animal cuteness of their recent tours.